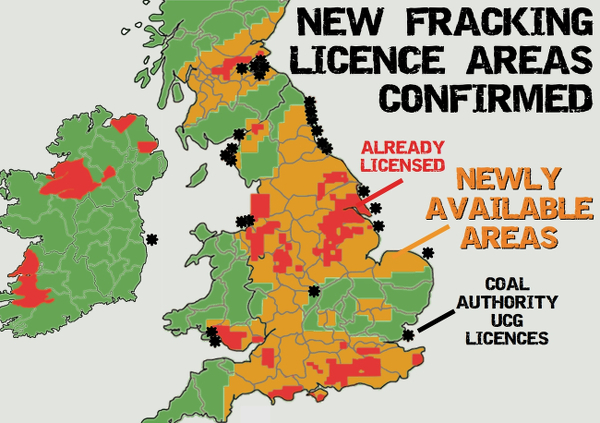 The UK government has announced that roughly 60% of the UK is now available to be licensed to fracking companies. The brief “consultation” period closed in March 2014. It is likely that the additional licenses will be handed out to fracking companies soon. The licenses would cover the exploitation of both shale oil and gas and coal bed methane (CBM). Click here… for an interactive map of current UK fracking sites and licences. The area is based on that covered by a newly finalised Strategic Environmental Assessment (PDF). Despite the name the document does not seem to be particularly focused on the environment and does not address the long term impacts of issuing these potentially 30 year long licenses. To extract the amounts of gas that companies are bragging about in existing license blocks would require tens of thousands of wells. If large additional areas are licensed next year, the scale of threat will be much larger still. These developments would devastate our remaining countryside, industrialising huge areas with well pads, pipelines, compressor stations and processing plants. The reality of unconventional gas is that it is very hard to extract. It is literally scrapping the bottom of the fossil fuel barrel. Densely packed wells must be drilled (up to 8 wells per square mile) over large areas, since each well individual wells does not produce much gas and then only for a short time. Worse, fracking is not an isolated technology but is part of a wider trend towards more extreme forms of energy extraction, which if not resisted could see even larger threats such as Underground Coal Gasification (UCG) become widespread. Right now the community around Barton Moss near Manchester is fighting the threat to their region posed by IGas Energy’s attempts to drill a Shale/CBM exploration well there. Across the country communities are getting organised to resist these threats, with over 100 anti-fracking groups already formed in the last two years, and that number growing fast.